This sophisticated men's timepiece combines Longines long-standing Swiss watchmaking heritage with a sleek, contemporary design. The brushed stainless steel bracelet is contrasted with accents of gold plating creating a stylish two colour finish. Set with a bold blue dial complete with date window and the classic Longines logo. 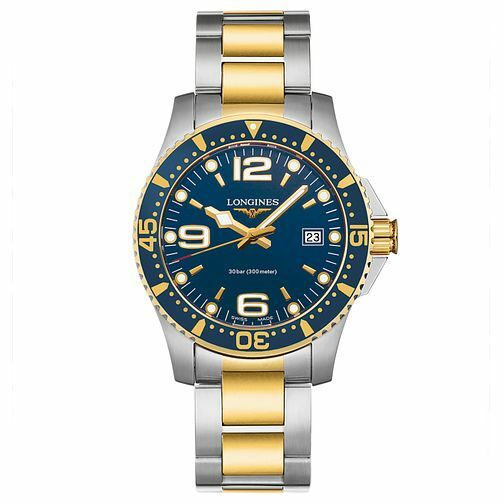 Longines' HydroConquest Men's Two Colour Bracelet Watch is rated 5.0 out of 5 by 1. Rated 5 out of 5 by Anonymous from Very nice timepiece. Feels like a very high quality watch. The Longines Hydroconquest I have purchased is a very nice watch. It has a very high quality feel to it. I particularly like the fliplock clasp. The bracelet was very easy to adjust as I did it myself. There is also a good micro adjustment system built into the clasp. All in all this is a fantastic watch with a very high quality feel to it.